The level of the VIX is one measure to gauge fear in the equity markets. When the near term VIX index is trading at a higher level than the VIX further in the future, for example, the 3 month VIX (or ticker VXV), then the VIX curve is said to be in backwardation. This is not the normal structure for the VIX curve as the VIX curve is usually in contango, meaning prices in the distant future are higher than those nearer term. For equity market volatility, i.e. the VIX, this makes sense as volatility inducing events are less predictable in the distant future versus today thus, the future VIX should be at a higher level than the near term VIX. As the below chart shows, in instances where the near term VIX is higher or significantly greater than one, this tends to occur near equity market bottoms. As the near term VIX begins to decline or fall below the future VIX or VXV, the equity market tends to move higher. This process can take place over a several week period, but nonetheless, the equity market does tend to bottom 'near' spikes in backwardation. 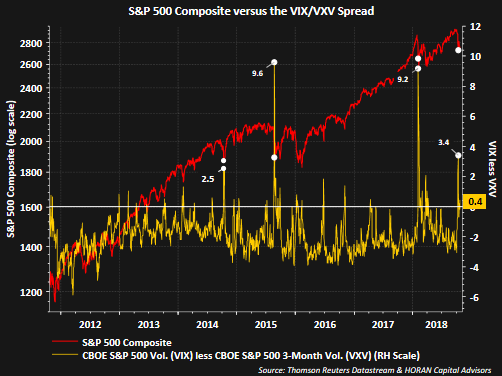 The recent spread between the VIX and VXV of 3.4 may have marked a near term peak in backwardation. If this is the case, the equity market may be setting the stage for a rally into year end.